Ambient air pollution is the air we all breathe and differs from more localised airborne contaminants that can result from work activities (including fumes, dust, silica etc) and which are linked to the workplace. The release of particles and noxious gases into the atmosphere originates both naturally from the sea, the soil and from plants, and from human activity, largely due to the combustion of fossil fuels such as coal, oil, petrol or diesel. The main pollutants of concern are particulates, nitrogen dioxide and ground level ozone. Weather plays a major role in the amount of pollution we are exposed to. During wet or windy conditions pollution concentrations remain low, either blown away, or removed from the air by rain. During hot weather, pollution is able to build up to harmful amounts, leading to what are known as pollution episodes. Concentrations also increase in winter when low winds lead to a build-up of traffic pollution. Employers have a general duty of care for their employees' health, safety and welfare. With research showing the ill-health effects of ambient air pollution, many would like to do more to protect the health of their outdoor workers. Reducing the time staff work outdoors during high or very high pollution alerts will help protect worker health. Daily information on air quality across the UK can be found at UK Air. Feeling short of breath from time to time is healthy and normal, but sometimes it can be a sign of something more serious. The British Lung Foundation has a free Breath Test based on the Medical Research Council breathlessness scale. Rotating work can reduce the time people work on or near busy roads every day, all year round, and will reduce their exposure to ambient air pollution. Scheduling work in and around rush-hour, heavily congested roads or avoiding, during this time, working in narrow streets lined with tall buildings (which can trap pollutants), can help make a difference. Encourage staff to reduce physical exertion at peak-traffic times if they are working on or near busy roads. This reduces the risk of ultra-fine particles entering deep into the lungs. 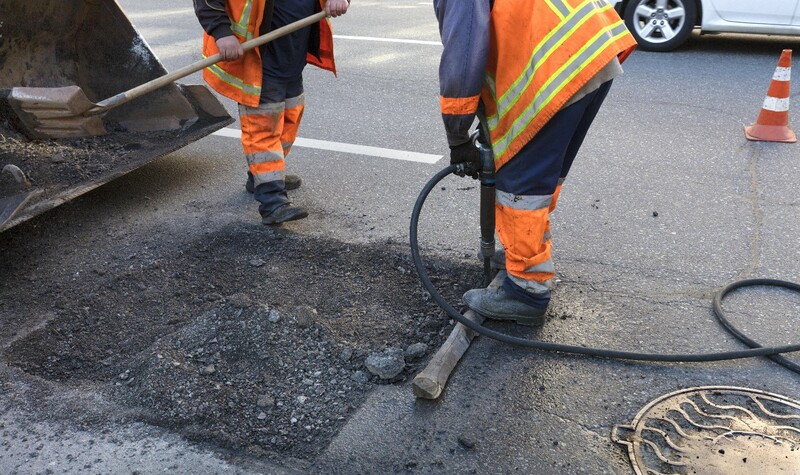 If workers are kneeling on or near busy roads as they do their jobs, they might be subjected to higher concentrations of air pollution than if they were standing up. Encourage these workers to regularly stand up and move away from the road, if only to stretch. Pollution barriers for roadside work can cut exposure by up to 20%. These are a relatively cheap option that will make a positive contribution to people’s health. Ozone can build up in the suburbs, away from city or town centres. Make workers aware that sore eyes, nose and throat are possible symptoms. Check air quality alerts and if possible reduce staff exertion during this time. Make sure outdoor workers are not working too close to machines. This way they can avoid breathing high concentrations of pollutants from engine exhaust emissions. Idle engines should be switched off and encourage workers to report back if machines are not operating efficiently. cross the road as quickly as possible. And once you're over, continue along the pavement as far away from the kerb as possible. There are some things that workers can do in own time that can help. Make staff aware that a good diet containing antioxidants such as vitamin C (oranges, vegetables etc) can help protect against some of the effects of pollution. Exercise is a good idea – pollution attacks heart and respiratory systems, so strengthening them will help protect worker health. Support initiatives like Unite’s Diesel Emissions Register, BOHS’s Breathe Freely campaign to prevent occupational lung disease and the Cross River Partnership to reduce emissions and advise staff on low pollution journeys or cycle routes. Finally, for London-based employers, Canairy is the App to help monitor and control outdoor worker’s exposure to ambient air pollution (click to Canairy page). Though outdoor workers face a range of risk-factors to their health, safety and wellbeing, any risks associated with ambient air pollution has tended to fall between those responsible for regulating occupational and public health risks. Read here how occupational and public health laws differ in how they regulate air quality.